TV-2 is a major danish pop band, probably the most succesful pop/rock band of the 80's and 90's. 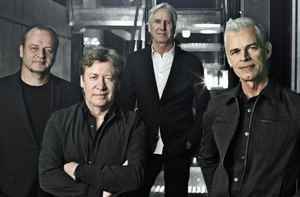 The four founding members were all members of the the 70's progrock band Taurus (22) that recorded a single album in 1978. Based in Aarhus, Denmark, in 1980/81 they re-incarnated as TV-2, short for Taurus Version 2. Without a record contract they recorded the self-financed debut album "Fantastiske Toyota". At the time lead vocalist Steffen Brandt was a member of Kliche (2). Like Kliche TV2 was inspired by the industrial new wave sound and was quickly signed by the Danish branch of CBS. Since then TV-2 has released some 20 albums, though after the first three albums the band sound and lyrics has turned away from industrial new wave to ironic pop, making the band one of the biggest selling groups of the 1980's and 1990's. In 1983 TV-2 released a cover songs album under the alias The Beautifuls titled "Om Sommeren Er Alting Anderledes". In 1999 the band established their own record company, PladeSelskabet - Have A Cigar.